Learn how to connect your production calendar events with dependencies. Dependencies are a great way to link Events that are contingent on each other. 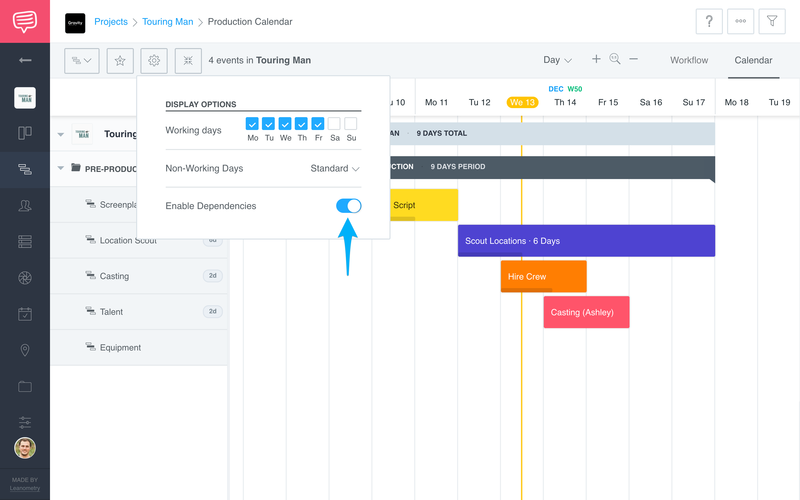 Dependent Events show their connection via arrows, and when Events overlap, red borders appear around them to indicate a scheduling conflict. Make sure Dependencies are enabled in your calendar's Display Options. Hover over an event until a Green Dot/Arrow (⇴) appears. Click and drag the arrow from one Event to the other to connect them. How do I remove a dependencies? Currently, there is no way to remove these dependencies besides removing those specific Events. Can I move multiple Events at the same time? Currently, you cannot move multiple Events on the Calendar page.